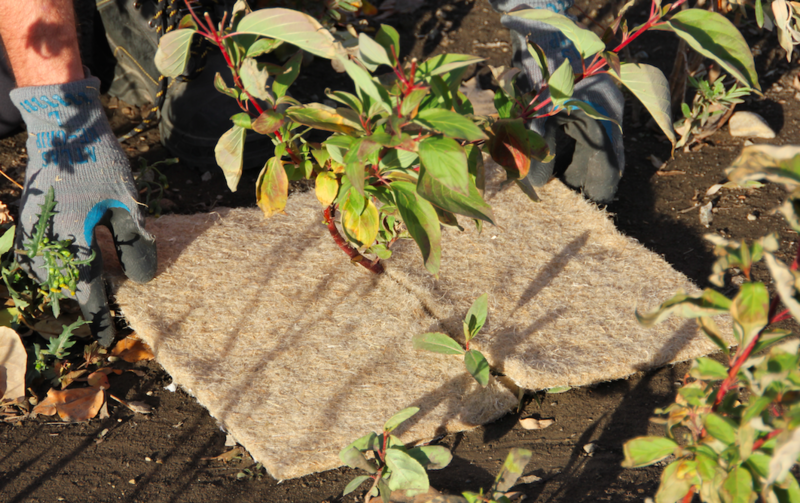 Terrafibre™ tree squares improve the growth and survival of a tree seedling by preventing weeds from germinating or growing. Placed on the soil around the base of a tree seedling, Terrafibre™ protects seedlings from competitive weeds stealing light, nutrients, and moisture. The insulation properties of hemp ensure protection from temperature extremes, providing an ideal growing environment for a tree seedling. Take one Terrafibre™ Tree Square. Place square around tree seedling, ensuring both edges in slit are touching. Hammer two stakes in diagonal corners to firmly secure square. 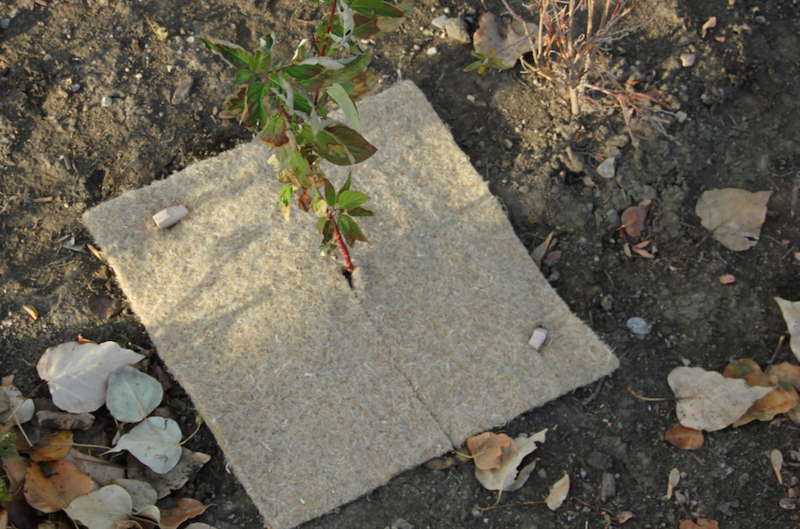 Terrafibre™ Tree Squares will suppress unwanted weeds while promoting seedling growth. ​- Traps moisture beneath squares. - Natural hemp fibres and a natural cellulose backing. - Protection from temperature extremes. 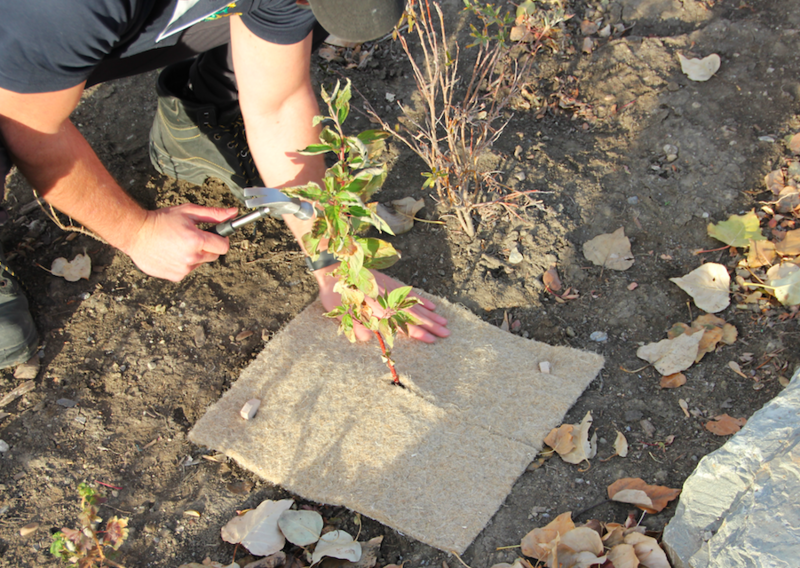 - Simply slip a Terrafibre square around the base of an individual tree seedling. - Lighter & easier to apply than mulches. - Allows zero light penetration, effectively suppressing weeds. - Terrafibre products use Canadian grown fibres that are cleaned and manufactured in Alberta. - Adaptability on uneven terrain. - Natural weed suppressant alternative. - Safe for humans, animals & the environment. 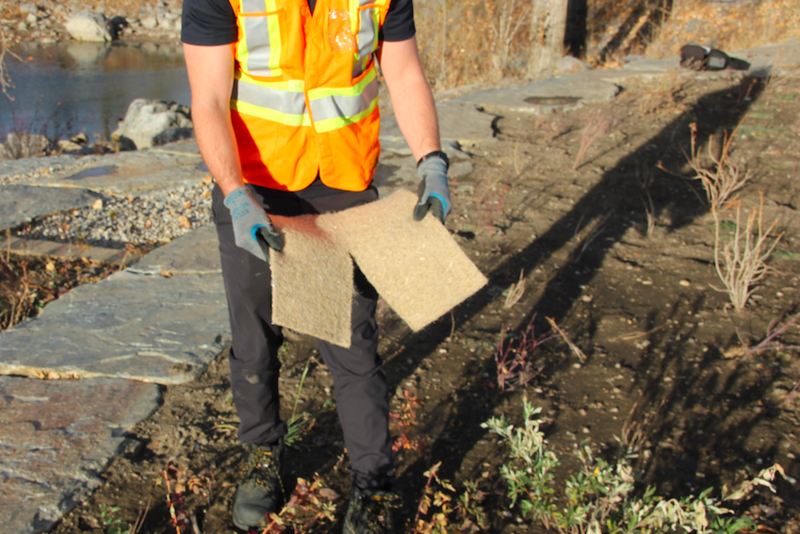 Terrafibre™ consists of 100% Canadian hemp fibres that are needle punched into a biodegradable pulp backing. 40% of the backing consists of post consumer recycled material. String reinforcement is made up of rayon with three openings per lineal inch. This backing increases the strength of the squares and also increases the suppressing properties. Hemp is a natural, renewable and fully biodegradable resource that will break down in 3-4 years. 12 " x 12" 16" x 16" 18" x 18"